The article discusses the nature of the gravimetric survey as applied and used in dolomite stability investigations on areas underlain by the Chuniespoort Group in South Africa. A short discussion is given on the gravimetric survey procedure along with its uses and alternative methods. Finally, two case studies illustrate the application of the method on a high-density survey grid spacing in comparison with three-dimensional geological modelling based on the lithology and karst weathering horizons of the Chuniespoort Group deduced from rotary percussion borehole data and limited rotary core borehole data. The two different case studies highlight the advantages and limitations of the high-density gravimetric survey. The first case studies shows that the high-density gravimetric survey can be applied to great effect to sites with a complex, variable profile, provided the grid spacing of the survey is adequate to identify the sub-surface features. Simultaneously, the findings of the second case study illustrate how the method has exactly the same limitations as regular gravimetric surveys if the scale of the grid is not compatible with sub-surface conditions. Development on dolomitic land in South Africa has been a topic of much discussion. The procedure of investigation and revision by authorities is constantly evolving and is periodically updated and improved to appropriately address matters of concern. A pivotal part of current investigative practice is the execution of a gravimetric study. The method is widely acknowledged to be the most applicable geophysical method for assessment of dolomitic sites. The application of two high-density gravimetric studies and comparative geological modelling are discussed to highlight the advantages and limitations of the high-density gravimetric survey. The two examples considered were researched as part of commercial investigations and are compared here in theoretical terms. Much has been discussed throughout the last few decades concerning the dolomite-related problems in South Africa. In recent times more emphasis has been placed on the risks associated with development on dolomitic land (Kirsten et al 2009), whereas in the past, the formation mechanism and influencing factors were researched (Brink 1981; Kleywegt - date unknown (a); Brink & Partridge 1965). Many catastrophic dolomite "events" have been discussed and recorded, the most famous of which are arguably those described by Brink (1981). Current practice in the industry is to conduct a dolomite stability investigation by means of a gravimetric survey, percussion drilling, surface investigation and reporting. Reports are reviewed by the Council for Geoscience and, based on the comments, additional investigation may be required or a proposed development may be supported or not. Whilst many individuals feel that this process is overly conservative, a number of authors have emphasised that developments on dolomitic land must be thoroughly investigated, and have observed that in the past, investigative steps were not completely sufficient; hence the continually evolving guidelines for dolomite investigation. Yet, despite thorough investigation, not every cavity or potential karstrelated problem can be identified (Brink 1981). The matter is not only restricted to South Africa, as discussed by Patterson et al (1995). A general observation is that results of a gravimetric survey should be calibrated and verified by means of exploratory drilling (Brink 1981; Botha & Mouton - date unknown; Trollip 2006; Kleywegt - date unknown (a); Enslin & Smit 1955) to verify the prevailing conditions and develop a model of the prevailing geology (Bosch 2008). The South African geotechnical industry has adapted the use of rotary percussion drilling for dolomite stability investigations. The method was applied in the past and drilling resistance and air loss were identified at an early stage as parameters which serve as good indicators of sub-surface conditions (Kleywegt - unknown date (b)). Under general conditions, percussion drilling for dolomitic investigations in South Africa is halted at a pre-established depth (e.g. 60 m or 100 m, depending on the geological nature and the results required) or when six successive metres of hard bedrock are encountered. In other countries the required depth of drilling is often more lenient. For example, Zisman (2001) describes that drilling in Tampa, Florida, is halted 1,5 m into bedrock. Though it is not the purpose of this article to discuss such matters, the occurrence of floaters in the South African dolomite profiles would render such limited bedrock drilling pointless. Ground penetrating radar (GPR) is a promising method for surveying near-surface conditions (Van Schoor 2002). The depth that the method can survey is its main limiting factor. Zisman (2001) indicates that the method is limited to depths between 30 feet and 40 feet and it is unable to penetrate clay zones. Van Schoor (2002) also indicates that cavities in the sub-surface are nearly undetectable in the presence of conduc tive overburden, whilst the presence of pinnacles or boulders could produce reflections that interfere with the data, thereby obscuring other data. Electromagnetic surveys were found to have limited potential in the investigation of dolomitic areas, due to a lack of resolution in highly variable conditions, and are more suitable for areas of shallow dolomite (Botha & Mouton - date unknown). The method is better applied to the identification of faults and dykes according to Enslin and Smit (1955). Seismic surveying is theoretically a good method for the investigation of dolomitic areas, as the expected high velocity through bedrock materials and a much lower velocity through overburden should provide good contrast. However, Formanek (1981) pointed out that the method is limited by the fact that low velocities cannot be detected below high velocities (e.g. a cavity below overburden or within thin bedrock cover). The author also stated that the accuracy of the method is affected by a rugged sub-surface, such as typically associated with a dolomitic, pinnacle-rich profile. Further limitations of the method include the fact that it does not discern small features clearly. Zisman (2001) concluded that the seismic method is more suitable to profiles in which the material density and subsequent sounding velocity increase with depth, a property which is frequently reversed in a dolomite profile. Resistivity surveys focus on the difference in electrical conductivity or resistivity of different strata (Zisman 2001). According to the author, the method is capable of surveying to a depth roughly equivalent to 20% of the line length utilised for surveying. In general, though, the method is useful for surveying depths of up to 30 metres (Zisman 2001). Enslin and Smit (1955) also indicate that the resistivity method was abandoned as impractical in application to dolomitic terrains. However, the method (multipole resistivity) can be applied with success to map slots and intrusions in shallow dolomitic bedrock. The gravimetric survey is a multi-phase procedure. The method consists of initial fieldwork and measurements (preferably on a grid) of small variations in the prevalent gravity field (Enslin & Smit 1955), followed by data processing and correction (e.g. for instrument drift). The initial results are generally utilised as a guide for percussion drilling. Thereafter the drill data is used to calibrate the gravimetric model. The size of the grid spacing on which the gravimetric survey is conducted is usually selected after reviewing the purpose and scale of the project. For example, surveys for large areas (regional) can be conducted using a 30 metre grid spacing, whilst medium-sized projects may utilise a ten metre grid spacing (Botha & Mouton - date unknown). 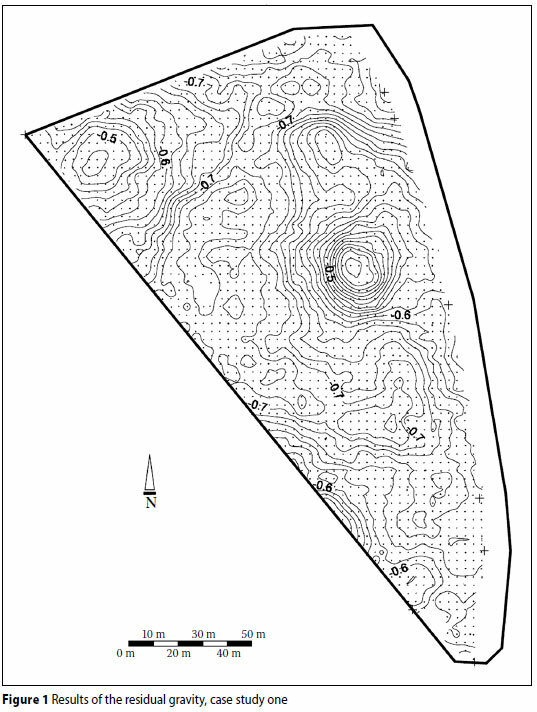 Guidelines provided by the Council for Geoscience (2007) also indicate that the grid spacing of the survey should not exceed the overburden thickness (i.e. the grid should be roughly the same as the vertical distance to bedrock), though this is given as a rough guide and can only be confirmed once drilling has commenced. The ultimate aim of the residual gravity survey is to indicate dolomite bedrock topography by estimating the thickness of the overburden (Trollip 2006; Kleywegt date unknown (a), Roux 1981). In doing so, potentially safe and dangerous zones can be identified which are to be investigated by drilling (Enslin & Smit 1955). A simplified explanation is that shallow bedrock will result in a higher gravity reading than deep bedrock, if measured from the same horizontal plane. The method is not without limitations, though. The equipment used is fairly sensitive, and as such excessive ground noise (e.g. drilling, blasting etc) will adversely affect the survey (Patterson et al 1995). Roux (1981) also indicates that the residual gravity survey will not present accurate readings over bedrock with steep gradients or structures which are narrow. Keeping this in mind, structures such as grikes or pinnacles may not be identified by gravimetric results (Trollip 2006) and may have a profound effect on the prevalent dolomite stability. The scale of features which may not be identified by a gravimetric survey may depend to a large extent on the grid spacing used for the survey compared with the size of the feature (e.g. a survey on 30 metre grid spacing will not recognise a five metre diameter cavity). The results of gravimetric surveys are dependent on density contrasts between materials in the profile (Van Schoor 2002). A typical survey would reveal areas of high, low and intermediate (or transient) residual gravity. Whilst one may hastily assume that areas indicated as having a "low gravity" would be the best target for cavities and adverse conditions, some authors do not agree. Enslin and Smit (1955) state that an area of closely spaced gravity contours (i.e. areas where a steep gravity gradient occurs) is likely to be problematic. To further complicate the matter, Trollip (2006) emphasises that different mass distributions may be associated with a single anomaly. Another critical element of the gravimetric method is the reproducibility of data. Though it is not the aim of this article to discuss the matter, the gravimetric survey is subject to recording errors and must therefore be analysed to ensure accuracy and reproducibility. As a point of interest, the equipment used for the gravimetric surveys conducted in this study was kindly subjected to reproducibility testing at the request of the authors. Upon discussing the matter of data reproducibility with Mr Richard Day of Engineering and Exploration Geophysical Services cc - the company which conducted the gravimetric surveys used in this discussion - data measurements were repeated on an independent site to assess reproducibility. The results were found to be satisfactory after data refinement had been completed. Critically, the data refinement included adapting data according to base station readings and removing trends. As can be deduced from the name, the high-density gravimetric survey is a gravimetric survey conducted at a short interval, using smaller grid spacing. In the context of this article "high-density" grid spacing was accepted as five metre grid spacing. In comparison, Patterson et al (1995) discusses a project using "microgravity", based on eight metre grid spacing. The high-density method uses the same equipment and principles as a regular gravimetric survey, with the fundamental difference being that a larger number of points are observed which provide more detailed data at closer spacing. The more detailed data, in turn, can be manipulated to give a higher resolution model of the sub-surface. The biggest negative aspect of the high-density survey is its cost, though execution of a high-density gravimetric survey remains more cost effective than closely spaced exploratory drilling, which may not necessarily yield a representative profile of the bedrock distribution (Brink 1981) and may also fail to intercept anomalies in the profile. The three-dimensional geological models may be formulated according to the geological information requirements of the engineering geological investigation, and this may include the classification of rock types into formal lithostratigraphic units or combination of rock types with engineering geological parameters. It is therefore important to log (or describe) the material obtained from rotary percussion drilling or rotary core drilling in sufficient detail to enable the interpretation and conversion of data into engineering geological or lithostratigraphic units. Examples of parameters to be described which prove most useful in this regard include the degree of weathering, the hardness of the rock, density of the rock, deformation of the rock, rock types, formal geological units or any combination of these. Subdivision of rock strata into formal geological units requires specialised knowledge of the regolith horizons, rock types and structures related to the dolomitic hazardous land. The complete compilation of the threedimensional geological models is a lengthy process. The entire method and steps performed can therefore not be included in this article due to space constraints. The first case study concerns a commercial development in the Irene vicinity. The study area falls within a larger area which was previously investigated on a regional level on two occasions. The area under investigation was roughly 5,7 ha in size and made out a small portion of the area previously investigated on a regional level. The region is located on the weathered and unweathered chemical sediments (mainly dolomite, chert, chertresiduum and wad) associated with the Chuniespoort Group, and bedrock in the area is extensively intruded by erratically distributed syenite. The geology of the dolomitic land may be highly complex, due to various lithological changes, chemical changes in the rock, variable weathering periods and associated karstic materials. Also, geological structures such as folding, faulting, jointing, igneous intrusions and karstic features are to be considered. The project commenced with footprint drilling on the layouts of the proposed structures and trial-hole inspection after consulting the available reports. The boreholes were placed after consulting the results of the regional gravimetric survey executed for previous (regional) investigations. However, drilling soon revealed extensive sample and air losses, along with rapid to intermediate drill rates and irregular drilling. In addition, hard bedrock was encountered at variable depths across the study area. In short, conditions appeared challenging and variable over short intervals and could not be suitably refined with the existing gravimetric survey, done on a regional scale. It became apparent that pinnacles were present on a portion of the study area, but a lack of sample recovery left uncertainty regarding the remainder of the property. Also, a lack of sample recovery limited the identification of overburden materials, a critical aspect considering that the dolomite stability of the study area was being evaluated. In order to evaluate the materials of which no samples could be retrieved by percussion drilling, four rotary core boreholes were drilled through the relevant depth intervals in an attempt to obtain representative samples from the profile. The materials recovered by the core drilling comprised unconsolidated chert residuum and (limited) dolomite residuum which showed signs of extensive low temperature hydrothermal activity. Both bedrock and residuum contained evidence of very fine (low temperature) hydrothermal crystallisation. The unconsolidated nature of the materials explained the sample and air losses encountered by percussion drilling, as chips and air pressure simply dissipated into the small voids between the residuum clasts. Whilst the state and nature of the materials in the profile were explained by the core drilling, the distribution and intervals of the residuum and bedrock were still not clear. After consulting Mr Richard Day of Engineering and Exploration Geophysical Services CC and discussing the matter with the client, it was decided to perform a more detailed gravimetric survey over the entire site. Where the previous geophysical survey was done on 30 metre grid spacing, the new (high-density) survey was done on five metre grid spacing. The survey was performed using a Scintrex Autograv gravimeter, taking readings at points set out by GPS. The results were processed using Surfer (version 9.9.785) software and refined using the existing borehole data. Figure 1 illustrates the residual gravimetric results. 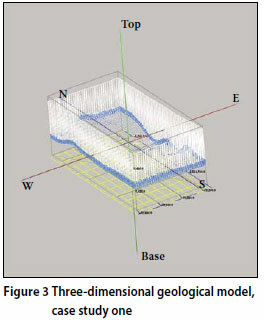 After refining the data using the existing borehole information, the data was manipulated to produce a three-dimensional representation, as illustrated in Figure 2. For the purposes of direct comparison between the three-dimensional geological modelling and the depicted gravimetric results, the three-dimensional model based on borehole data had to be simplified. As the gravimetric survey is concerned only with estimating the depth to bedrock (or conversely the thickness of overburden), the borehole data was drastically simplified into two classes, namely overburden (comprising all non-bedrock materials) and bedrock. Based on the current requirements for dolomite investigations, bedrock was assumed to be hard bedrock, as defined by drill times exceeding three minutes per metre drilled. Borehole locality information, collar altitude and borehole depth intervals of the defined units were compiled in a Microsoft Office Excel® spreadsheet. These spreadsheets were then imported into the RockWorks15 (a product of RocWare®) software which was used to compile isopach maps of the thickness of the various units. The results of extensive isopach modelling were then manipulated to produce crosssections and three-dimensional solid and transparent block diagrams that display the architecture of the various chosen units. In the case of the studies at hand, though, the extensive isopach comparisons will be omitted due to publication constraints and only the three-dimensional representations compiled from borehole data will be compared with the results of the gravimetric survey to ascertain the ground truth of the predicted bedrock profile. The model derived from the borehole data is illustrated in Figure 3. The results of the high-density gravimetric survey enabled the engineering geologist to piece all the information obtained together and derive a hypothesis of the karst profile investigated. It is emphasised that this is merely a hypothesis, as verification would require intensive further regional investigation. It is speculated that vertical displacement occurred on the site, presumably along a normal fault, resulting in one portion having bedrock at a significantly deeper interval than the remainder of the site. As time passed, chert residuum backfilled the vertically displaced area to produce a near uniform ground level. The intrusion of syenite in the vicinity was most likely the cause of hydrothermal activity, which forced thermal fluids to move through both the dolomite bedrock and the residuum. This is evident from the fact that the crystallisation was encountered in both residuum and bedrock materials. In this case study the high-density gravimetric survey proved to be adequate in interpreting the prevailing site conditions and profiles. Though costly, proving the same results by means of additional (exploratory) rotary percussion drilling or rotary core drilling would have resulted in considerably bigger expenditure and most probably would not have yielded as clear a model as had been delivered by the gravimetric survey. From the observations made by comparing the three-dimensional model derived from borehole data with the gravimetric results (and subsequent model) it appears that the geology of the area is complicated and not readily explained. As an example, the modelling of boreholes presented a second possible hypothesis in that the dolomite profile may be explained in terms of structural geology as an anticlinal ridge, rather than a vertically displaced fault system. Nevertheless, detailed investigation showed that the distribution pattern of the gravity signal is representative of the geological strata, the structures and the extent of weathering resulting in the bedrock profile. In summary then, on this site the gravimetric survey conducted on 30 metre grid spacing for the regional investigation could not be effectively utilised to interpret the karst topography for small areas, as the results of the survey are scale-dependent. The results of the high-density survey, though, proved pivotal in explaining the prevailing conditions and correlate well with the ground truth model produced from borehole data. As with case study one, this project involved a proposed commercial development. The larger surrounding area had also been investigated on a regional level in the past and, as in the first case study, the area is also underlain by dolomite and chert in addition to karst weathering products of the Chuniespoort Group. The study area consisted of only the footprint area of one proposed building and its immediate peripheral area, and is significantly smaller than the area investigated in case study one, covering an area of some 5 400 square metres. The investigative procedure again commenced with trial-hole inspection and rotary percussion drilling, after consulting the existing report and results of the regional gravimetric survey. Again, it was realised that conditions within the footprint area were inconsistent and erratic, as dolomitic bedrock appeared to be incised and filled with variable materials, and therefore the regional gravimetric survey was not sufficient. It was deduced that the site was underlain by bedrock which had been incised by (what is now) the Sesmylspruit - a perennial water course in close proximity of the study area. The incisions in the bedrock were subsequently most likely backfilled by alluvial materials (i.e. river deposits) comprising a material mixture which includes both fine sandy alluvium and massive transported boulders. Such mixed alluvial materials are frequently encountered in the flood plain of the Sesmylspruit. It was once again decided to conduct a highdensity gravimetric survey on the site, using five metre grid spacing, as opposed to the 30 metre grid spacing used for the regional survey. The survey was performed using the same equipment and methodology indicated in the first case study. 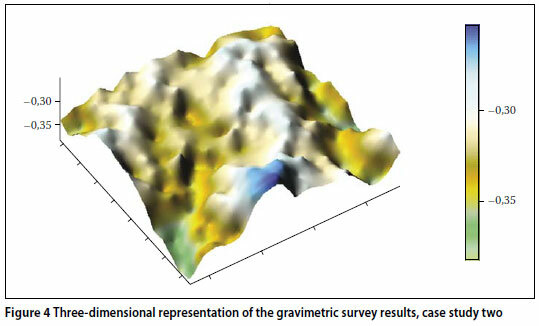 The data from the boreholes already drilled was used to refine the model produced by the gravimetric survey, and the results of the calibrated model were indicative of the complexity of the sub-surface, as illustrated in the threedimensional depiction of the gravimetric survey (see Figure 4). Based on this model, additional percussion boreholes were drilled at key points in an attempt to gain further insight into the profile. The additional drill samples that were obtained, confirmed the initial findings of a highly irregular bedrock profile. However, upon considering the information obtained from all the boreholes drilled, compared with the results of the high-density gravimetric survey, the results were not entirely sensible. Occasional air and sample losses were recorded whilst cavities were encountered in areas of low and intermediate "gravity", which is in accordance with the current understanding and application of the method in dolomitic environments. However, a cavity was also intercepted in a "gravity high" area. This borehole contained (what is interpreted as) a succession of dolomitic boulders in an alluvial matrix, with hard bedrock encountered at a depth of 25 metres. In comparison, another borehole located on a "gravity high" area revealed hard bedrock from a depth of six metres. The converse was also encountered in a borehole in a "gravity low" area revealing hard bedrock at a depth of seven metres. Simply stated, the borehole data contradicted the gravimetric survey in a number of occasions. The geological model compiled for case study two was produced using the same assumptions made for case study one; hence borehole data was divided only as bedrock or overburden to simplify the model. 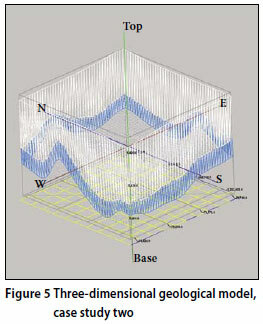 The geological model compiled from borehole data depicts a significantly different image than portrayed by the gravimetric results. That being stated, however, it is anticipated that, due to the highly variable sub-surface conditions, the amount of data obtained from boreholes is not sufficient to produce an entirely representative model. The model based on borehole data is illustrated in Figure 5. Both the ground truth model (based on borehole data) and the model resulting from the gravimetric survey show that the area is geologically and structurally very complex. The area has a complicated sub-surface topography of ridges and valleys. These features were interpreted as incisions and pinnacles that were influenced by flow channel erosion and differential (and preferential) weathering by the adjacent Sesmylspruit. Such erosion occurred in the geological history of the area. Regardless of this, some features identified by the gravimetric survey could be related to the geological model, though the correlation was poor, at best. In addition, the limited accuracy of the geological model must also be anticipated. Conditions were simply too variable over very small intervals to allow accurate depiction by the gravimetric survey alone, even one executed on a five metre grid. The high variability of the area exceeds the potential of the grid spacing applied. As such, pinnacles or cavities may be misinterpreted or even missed. Even large structures were not easily identified with the gravimetric survey and these only became apparent with the aid of the three-dimensional geological modelling, which is also considered to be of very limited accuracy. It also appears that large dolomite boulders set in alluvium may deliver false representation as bedrock or pinnacles by the gravity survey, but this interpretation may be corrected if boreholes penetrate these boulders and are drilled into the underlying lithologies. All things considered, the gravimetric survey that had been conducted at a higher density failed to provide sufficient additional insight into the bedrock profile, a limitation also suffered by the model that was produced based on the borehole data. In this case, it is anticipated that the only manner of identifying the true bedrock profile would be to conduct exploratory drilling - most likely on one metre grid spacing - followed by intense stratigraphic modelling. This never materialised though, as the adverse conditions encountered (i.e. large cavities in the profile) resulted in an unfavourable inherent risk classification, disqualifying the site from use for the proposed project. The project was ultimately abandoned. The high-density gravimetric method proved to be an excellent and potent tool under suitable circumstances, but also failed to be of notable use on its own under intensely variable (variation from one metre to the next) conditions. It was found that the results of this method compared well with true conditions encountered on site one. However, the predicted model failed to show notable correspondence with the model produced for site two. The real life model produced for the latter site is also expected to be of limited accuracy, due to the high degree of variability in the sub-surface profile. The method is susceptible to a scale factor. As such, conditions with high variability over very short intervals may not be accurately depicted by the method, as proved by case study two. The method is known to depict rapid changes such as steep gravity contours (e.g. incised channel walls) inaccurately. Large boulders in the profile may deliver misleading results, as proved by case study two. The method requires verification (e.g. drilling of boreholes) and may not be accepted as a representative model of actual conditions without such verification. The grid spacing at which the survey is done must be appropriate to the nature of the ground conditions in the study area, and critically, to the underlying profile. This grid size of a high-density gravimetric survey cannot be estimated until an initial survey and drilling has been done. The application of a high-density gravimetric survey, though costly, will prove more viable when compared with the costs of exploratory drilling on similarly sized grid spacing and subsequent intense modelling. The method delivers a wealth of information which, upon verification by drilling, enables the investigator to derive a model of the sub-surface and explore key areas. In conclusion then, the high-density gravimetric survey is a method worth considering on sites which prove challenging as far as the prevailing profile is concerned. The method can serve as a potent aid in understanding the prevailing conditions and formulating a geological model in the same way that surveys on a larger grid are used to verify regional scenarios. Due to the costs related to such a survey, the method should preferably only be applied to sites where the only remaining alternative is exploratory drilling on a fixed grid. However, the method still suffers the same limitations as conventional gravimetric surveys, and as such must be interpreted and considered within its limitations. Finally, the comparison between the models predicted by the gravimetric study and the three-dimensional models depicting real life conditions, emphasises the extent to which the modelling and characterisation of borehole data can benefit the investigation and understanding of the karst profile. 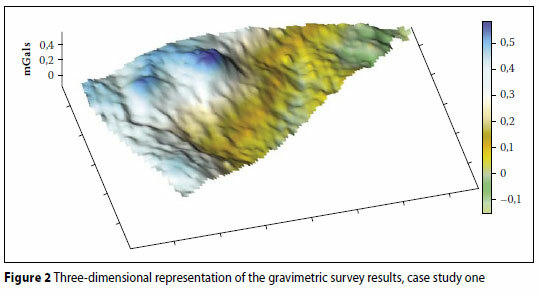 Whilst current practice requires the use of gravimetric analyses only, the additional geological modelling considered in conjunction with gravimetric data can be manipulated to produce sub-surface models of greater accuracy in a complex geological environment than can be produced by a gravimetric survey or even high-density gravimetric survey. However, the greater accuracy of such a model would necessitate additional exploratory drilling resulting in amplified costs. The authors wish to thank Soilkraft CC and the Council for Geoscience for the opportunity to produce the research at hand, and also M&T Development for granting the provisional use of project data for the research. Thanks also to Judith Grobler of the Council for Geoscience for assistance in obtaining some hard-to-find literature. Many thanks are due to Mr Richard Day of EEGS for on-going assistance and advice with many aspects of the geophysical methods. Finally, the contributions of Dr R J Kleywegt and Mr I S Venter are also acknowledged with gratitude. Izak Breytenbach obtained his MSc degree in Environmental and Engineering Geology from the University of Pretoria in 2009. He is a Professional Natural Scientist registered with SACNA SP (South African Council for Natural Scientific Professions) and a member of SAIEG (South African Institute for Engineering and Environmental Geologists). He works as consultant in the engineering geological and geotechnical field. PIETER BOSCH , a Professional Natural Scientist, obtained his MSc (Geology) from the University of Pretoria in 1992. He is a Chief Geologist at the Council for Geoscience in Pretoria with 26 years' experience. Pieter specialises in field mapping, sedimentology, dolomitic hazardous land, road aggregate mineralogy and three-dimensional modelling.